We have had a few warm days here over the past couple of weeks ( a little to few and far between, but we'll take what we can get!). Warm weather for our family means tons of time spent outdoors in the backyard on the swing set, playing t-ball, riding bikes, and bubble toys of course! Gearing up for Easter was easy with the Limited Edition Jelly Belly® Easter Bubbles! The kids (and I) had a blast making yummy scented bubbles with the Giant Bubble Wand (pictured below; available in 3 scents), and the Blasto's! Bubbles. 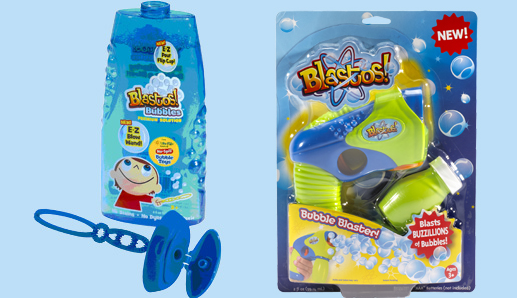 Blasto's Bubbles are not only extremely user friendly (all of the bubble fun without the mess), they are made even better with the Blasto's! Bubble Maker (Pictured Below)! This fun alternative to the traditional "bubble wand" makes tons of bubbles instantly with the simple push of a button (the kids were delighted by the instant flow of bubbles!). B loves the All New Junk Ball Glow in the Dark Bat & Ball Set! With a super easy pitch and hit system (there's a "sweet spot" on the bat that allows little one's hits to go farther), both of the kiddo's are excited to try it out on summer nights (anything that glows in the dark is always a huge hit in our house!). With all of the fun offered in the Little Kids Inc. brand new line of products, there's fun to be had by everyone! All of these great items would make fantastic addition's to any Easter Basket! 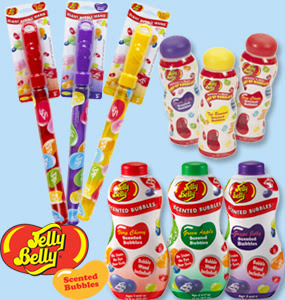 Jelly Belly Scented Bubbles make the perfect addition to any Easter basket! Grab the best solution for a candy alternative. Products available in the Limited Edition line include: Giant Bubble Wands, Squeeze 'n blow pop up bubbles, an 16 oz. Scented Bubble Liquid. Blastos! Bubbles™ Premium Solution makes blowing bubbles easier for kids & moms! •Premium bubble formulation for bigger, stronger bubbles! 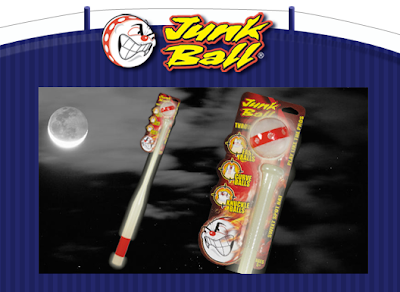 Don't let dusk end your backyard ball game - Junk Ball Bat & Ball Set now Glows in the Dark! gives you super home run power. The Junk Ball baseball's exclusive "Dial Your Pitch" feature allows anyone to throw fast balls, curve balls, sliders, even knuckleballs - just turn the dial to adjust airflow through the ball and aim the dynamic scuff marks.